Really interested in the product, just wanted some feedback before making a purchase. I ordered one and have received it with an extra collar, because I run two dogs. Have not field tested it on a hunt yet. 6 more days!!!!!! Strapped the collar to my leg to test the shock/training levels. It should be effective! 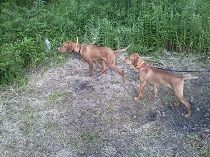 I have each dog program into the unit; with a different track color and compass pointer color for each dog. So on the compass page I am tracking both dogs at once, including if one or the other or both are on point. I have used both Garmin and TT products for years so I had no problem buying this unit. I am sure there will be upgrades available online. Garmin's customer service is top notch. I like the idea of only one controller for both tracking and training. I did not get the maps, because the screen size is to small to be helpful. I am a bearing and distance sort of guy. One of the first things I did was crimp on a 60 pound test wire leader through the bottom loop of the handheld and used a heavy fishing snap that clips to my vest. This unit sits in a holster sitting high on my left shoulder so the long antenna is as high as I can get it. The handheld slips out of the holster so I can check on the dogs often. The instruction manual is optus like most computer manuals. The manual should be written by a bird hunter and not a computer geek. How about an update on this unit. With my hearing and the wind I can't hear my beepers much past 50 yards. I am interested in this product as well. Has anyone put it to the test in a field situation? My take is that the satisfication depends upon how comfortable the user is with fiddly re the touchscreen, etc.....and, it eats batterys. I'll stick to the Astro and a seperate e-collar for the rare time I need one....as well as eggs in one basket reasoning. I have been using one in the field now for ten hunt days. No problems with the touch sreen or batterys.The batterys have at least 50% charge after hunting for eight hours. 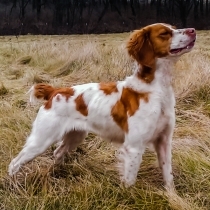 Hunting with a younger dog and using both the tracking and e-collar has been a joy. here in pa with LEAVES on trees,our GPS do not work to good. then throw in bad weather with heavy clouds, not too good. - You have to calibrate the compass alot. Every 5-20 min. Shows your dog opposite of where he really is, and has you going in the opposite direction. Its easy to figure that it needs calibrated because the north arrow point doesnt move as you move it. - For some reason it zooms out and I cant find out why. - Some people have know idea how to use it. Although has some issues I would recommed it. A must have for medium to long range dogs. Training controls are simple. I have gotten so old I can hear shi**. My beeper collars are ok if the dogs are not more than 100 feet from me, but my dogs hunt pretty wide. They are broke, and they will hold, but I can't find them half the time in thick cover. I hear the beeper but can't figure out in what direction the sound is coming. Thought the info on the screen of these things could help me locate them quicker. I don't mind spending the money but want to get what I am paying for. The collar is cheaper than hearing aids. i have friends that are using them in deer season to get back to their truck in dark. they leave the collar in truck and use it too get back. it works great they said for that but LEAVES are off treesthen. i have 3 GPS units and all lose signal at times. it scares the h out of you in dark walking out of bigwoods here in pa.
that is why i carry compass. Quailtail wrote: I have gotten so old I can't hear. My beeper collars are ok if the dogs are not more than 100 feet from me, but my dogs hunt pretty wide. They are broke, and they will hold, but I can't find them half the time in thick cover. I hear the beeper but can't figure out in what direction the sound is coming. Thought the info on the screen of these things could help me locate them quicker. I don't mind spending the money but want to get what I am paying for. The collar is cheaper than hearing aids. this is why i got dog SMALL MUNSTERLANDER that hunts close.those wide ranging out of sight dogs are not for me. i like SEEING my dogs working. 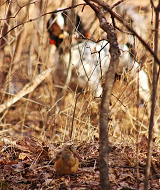 yes, if dog covers more territory, you most likely will see more birds if they hold until you get there. but on good day i see maybe 4 grouse CLOSE and dog working in front of me. thats enough birds to enjoy day. hunting more than 3 hrs anymore at 58 yrs young is tiring. short day hunts are enough for me even tho whiskers will hunt all day if i like. i hunt 3 hrs, see 4 birds or more at times, quit and go to lunch for cheese burger and fries and beer. No need to leave the collar at the truck, the handheld will prompt you to mark your truck's location when you start a new hunt. And always erase the old tracks and start a new hunt, always. Neil wrote: No need to leave the collar at the truck, the handheld will prompt you to mark your truck's location when you start a new hunt. 1. - You have to calibrate the compass alot. Every 5-20 min. Shows your dog opposite of where he really is, and has you going in the opposite direction. Its easy to figure that it needs calibrated because the north arrow point doesnt move as you move it. 2. - For some reason it zooms out and I cant find out why. 5 - Some people have know idea how to use it. Although has some issues I would recommend it. A must have for medium to long range dogs. Training controls are simple. 1. check the following: Setup > Heading > Compass: Select compass mode chose auto. 3. It appears static is building up on the regular collar and discharging to the Alpha. Garmin is aware and working on the issue. Can you say with certainty that it works fine with no additional collars? Only fails when the regular collar is on? If you need to run with another collar, put electrical tape over the contacts or put the collar on upside down so the contacts are away from the regular collar. 4. Can't help with that. Is it related to number 5 on your list? 5. Trying to help out where I can. I don't want people bad mouthing the technology if the problems are solely because they don't know how to use it. And no I do not work for Garmin. I just think the technology is very useful for hunting dogs. I like mine. I can't compare it to others, though, as this is the first collar trainer I've had. The one annoyance I haven't gotten situated yet is it bouncing around as I have it on a rope around my neck. When that happens, you easily zoom in and out or other random things as it 'touches' the screen when bouncing along your chest. I know this is fixable, just haven't done it yet. For now I have to lock and unlock it. Battery life seems fine for me. I'm used to other handheld GPS units for hiking, and I know they do eat batteries, so battery life is about what they report, I'd guess. Just got mine for two dogs. Wow this thing is loaded with features I will probably never figure out how to use but you never know. Been messing around in the yard and we have lots of trees and so far seems ok. Will take out in the field today. I like the fact that it has the big buttons and touch screen like my Iphone. Need to figure out a holster for my vest now. Last edited by donnie_19 on Fri Nov 09, 2012 3:27 pm, edited 1 time in total. donnie_19 wrote: Just got mine for two dogs. Wow this thing is loaded with features I will probably never figure out how to use but you never know. Been messing around in the yard and we have lots of trees and so far seems ok. Will take out in the field today. I like the fact that it has the big buttons and touch screen like my Iphone. Need to figure out a holster for my vest now. if you use it in deer or Bear season or if you go to maine to hunt,I THINK ITS WORTH MONEY. i have friends that only use it to get back to their truck at end of day. my question is,CANYOU USE IT ON DOG AND THEN USE IT TO GET BACK TO YOUR TRUCK AT END OF DAY? Yes, on the 220 you just select start new hunt when you get out of the truck. It will ask if you want to mark current location as truck, select yes. It continues to track any dogs as well. I am sure the 320 and Alpha are the same or similar. thanks guys .here is my situation. 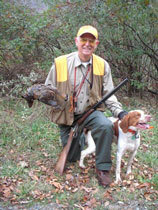 i hunt grouse in pa and i would like to go to different areas I DONT KNOW. my GARMIN LEGEND i hate, it cuts in /out and loses signals. scares the h out of you. so i need better gps to get back to truck in strange areas. next,whiskers is SM. he hunts about what i like,no more than 50 yds out in front. we do have deer/bear and porkys if i know he is near one. so, i need better GPS and i am planning trip to maine with whiskers. do i need e-collar ? which alpha is. most i talk to say yes but most dont use it after pup gets little older but its there in case you need it. as of now I HAVE NO E-COLLAR or gps that i like. i would guess a e-collar rebuilt will cost me 250 dollars. a better GPS would cost over 200 ,i believe. in this situation am i better to get alpha or save say 300 on rebuilt e-collar and better gps ? i guess we all agree i still need e-collar thing incase i need to correct whiskers in future? THANKS. I MADE THE CHANGES AND I WILL TEST IT OUT TOMORROW. I WASNT BAD MOUTHING GARMIN I LOVE MINE. I WENT TO WISCONSIN , HUNTED FOR A WEEK AND DIDNT GET LOST IN THE WOODS, THAT I WAS VERY UNFAMILIAR WITH. I USED TO USED A DELORME AND IT WAS 50/50 ON FINDING MY TRUCK. I used mine today. First time but I think it is a great tool to keep track of my dogs and my truck. My hearing is not so great so I can''t locate with the beeper. I didn't go far but it was flawless with the information provided. Always knew where both dogs were and how close or far. I have been training my dogs to recall when they hear the beeper in the receiver so that's a big plus for bigger running dogs. My dogs recall when hearing two blasts on the whistle, with high winds this is a plus when they get out a little farther or going in the wrong direction. Not for everyone but I don't need or want for my dogs to be boot shiners. Also showed when they were stopped for any extended period of time. I have a lot to learn but was impressed. I WASNT BAD MOUTHING GARMIN I LOVE MINE. I WENT TO WISCONSIN , HUNTED FOR A WEEK AND DIDNT GET LOST IN THE WOODS, THAT I WAS VERY UNFAMILIAR WITH. I USED TO USED A DELORME AND IT WAS 50/50 ON FINDING MY TRUCK. Didn't mean to insinuate you were bad mouthing the technology personally. I was talking more in the general sense. People (most likely ones that don't own the Garmins) will see that four people you know returned their units because they couldn't get them to connect and say Garmin released junk. When it is much more likely that those guys didn't realize that pairing the collars on the Alpha is different than on the Astros. On the Alpha, you have to hold down the collar's power button for a length of time to set it to pair mode. Then you have to pair it through the add a collar function on the handheld. Knowing a little bit about Garmin developed these units, I am actually amazed at how much thought they put into it. And how much effort into getting it right. I paired my second unit no problem. Even named my dogs. question,on like dogtra t&b collar you can push button on remote and get beat on your dog so you canhear his location. NO the Alpha does not have the locate tone. JIM K wrote: question,on like dogtra t&b collar you can push button on remote and get beat on your dog so you canhear his location. You just look on the compass and it shows the direction your dog is and how far in yards or ft. Also lets you know if his is standing still. No need. Just look at the screen and you will know where your dog is. brad, thanks for info. trainers in my areA use dogtra t&b on their dogs. they like the BEEP so they can recall their dogs. they dont like yelling or whistle, they train dogs on BEEP of collar. also theyt still like idea they can push button and HEAR beep 1 time to locate dog, no looking at screen etc. that was their only complaint with ALPHA. What does basecamp do for me? How do people recall their dogs with the beeper? How is the dog supposed to know where you are? The receiver does have a tone but its not loud enough for the handler to hear from any distance. Not the same as a beeper. I use the tone feature on mine to recall my dogs instead of blowing the whistle. They always seem to find me and not as annoying as blowing a whistle each time I want them to come in. If they are a hundred yards out and the winds blowing they can't hear the whistle anyway. I used the Alpha in SD this year and it worked great. I liked being able to check the handheld to find out where my dog was when I lost track of her when she was in cover. Instead of debating on whether or not to whistle or beep her to come, and risk her being on point, I can just glance at the handheld. Also, the alerting feature is nice. There were a few times that I would not have known she was on point until I started looking for her. This helped bag more birds by getting me to her quicker before they had a chance to run off. I also used it to mark all of the land we have permission to hunt so I can find it easier and not rely completely on my (bad) memory. If you are having problems with Compass or the pointer tracking the dog call Garmin. They have a fix. THE FIX IS WONDERFUL!!!! I use the "Birds Eye Imagery" on my 320, and love it. Any one find a decent holster for the hand held? Had my unit out today and tried to change from small numbers to large I lost 1 of the tracking for a dog. Tried to scroll through the menu and couldn't get the collar back in trakcing until back at the truck I deleted the collar and resinked with the hand held. Got to be a better way. 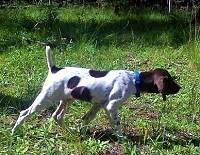 donnie_19 wrote: Had my unit out today and tried to change from small numbers to large I lost 1 of the tracking for a dog. Tried to scroll through the menu and couldn't get the collar back in trakcing until back at the truck I deleted the collar and resinked with the hand held. Got to be a better way. After you changed to "big numbers" what were you expecting to see on your screen? What did you actually see? If you could use the screen capture function to take shot of your display in 'big numbers" mode and post the pic, that would be helpful. I don't see how to capture the screen. Turns out that when you switch to large numbers there is an arrow above and you can switch to the other dog or dogs. Just can't view two dogs with large numbers. I am going to have to change to my bifocal sunglasses. Last edited by Retiredbirddogman on Sat Dec 08, 2012 6:42 pm, edited 1 time in total. donnie_19 wrote: Any one find a decent holster for the hand held? A buddy of mine had some amish make a few holsters that are real nice. I have a Garmin Astro 320, my hunting buddy just bought an Alpha. Here is what we learned yesterday: (1) Astro or DC40 collar interferes with the Alpha & Alpha collar and Alpha will not sync with it's collar when the Astro is on, (2) Astro cannot see the collar of the dog wearing the Alpha collar & vice versa, (3) Alpha and collar must be turned on in the proper sequence or the units will not sync. Garmin customer service helped my friend change the code of the Alpha to hopefully eliminate the conflict with the Astro - still to be confirmed. Not sure about this one as I was not the one talking to Garmin customer service, but something was discussed about using map chips in the Alpha - if you put a chip in the Alpha the total memory available is reduced to the size of the chip memory. Therefore, if you want more detailed maps, buy the maps on CD/DVD or download them and load them into the Alpha memory from your PC. Like all new technology, there are tradeoffs. I like my Astro and have no plans to upgrade. Used my Alpha for the 5 days in Kansas. What great piece of equipment. Both my young dogs have pretty good legs and always seem to go opposite directions. Never had an issue with knowing where each was at all times. I would have never believed they ran as many miles each day. They both averaged 30 miles each day and around 10 mph. So what kind of range are you guys getting out of the Alpha? How much does the terrain affect it's range? Have any of you tried some of the long range antennas that are sold separately? range here in pa mts is about 4 miles from what randy at LCS told me. i bought my new GARMIN ALPHA TODAY. alpha comes with long range antenna and regular one. Highway Ends Kennel wrote: So what kind of range are you guys getting out of the Alpha? How much does the terrain affect it's range? Have any of you tried some of the long range antennas that are sold separately? Although I havent used on yet you or I are not going to get much use out of this thread. Seems alot of the posters are fro out east where its heavily wooded. Out west its wide open and we should get pretty good reception. We were on the edges of some timber area's in Kansas and the collar still communicated with the hand held. Can't say if both the hand held and collar were in big timber if they would work as well. Probably be ok with leaves off the trees. ThunderFlush96 wrote: Really interested in the product, just wanted some feedback before making a purchase. i tested GARMIN ALPHA at least 3 times a week for month. 1 major problem was found. with snow on ground it reflects light. it makes alpha screen darken to about 50% . not good. i dont wear reading glasses so this caused me to have to get reading glasses to see screen. when there was no snow on ground, it seemed to be at 70% on brightness. enough you can use it. i was out in cloudy day. on sunny day it has to be even worst. other than that MAJOR problem, alpha is great.